Make and take bookings in a flash. Our aim was to create a system that makes your life easier. No complicated User Interface (UI), no lengthy setup and no steep learning curve. Our system has been built from the ground up by a dedicated tech team, working directly with Golf courses and implementing feedback as the product evolves. The result is a very quick, simple and easy to use UI that caters for multiple sports and ensures you NEVER get a double booking – optimising your courses tee slots in an instant. Adding manual tee time booking’s couldn’t be simpler! Our quick access UI adds customers bookings and block booking reservations in seconds. Completed customer bookings are streamed directly to your live tee time calender accompanied by a booking email notification to your chosen email address. 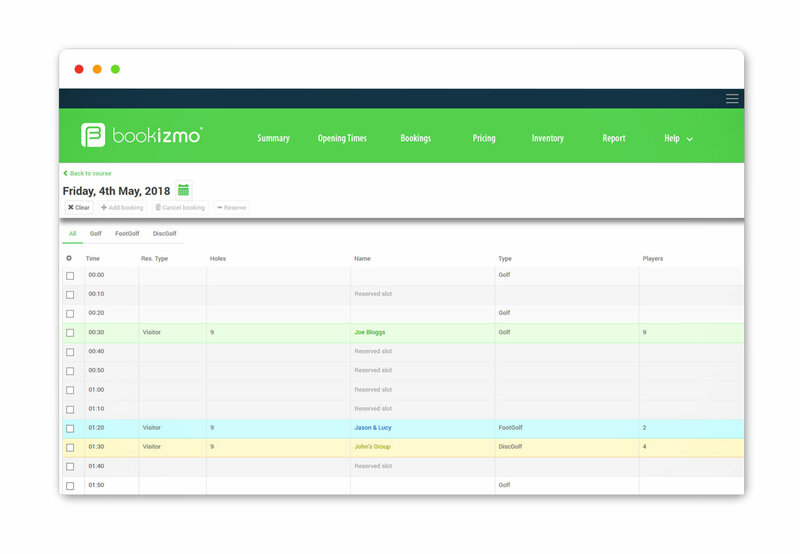 Bookizmo also features a daily summary feature, sending you an overview of tomorrows booking via email – ensuring your ready for the day ahead. We keep things simple so you don’t have to spend time learning a vast, complicated system. Our intuitive UI makes accessing your bookings, changing prices, amending opening times or managing you tee sheet a cinch.